The triple-double machine has proven to be an elite option in the NBA, pushing Russell Westbrook rookie cards to new heights. With Kevin Durant making the move to the Golden State Warriors, Westbrook has firmly established himself as the face of the Oklahoma City Thunder franchise. Showing the full transformation, he also earned MVP honors for the 2016-17 season. 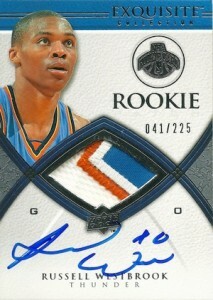 As such, Russell Westbrook's earliest cards are seeing strong interest from collectors, and moving higher. 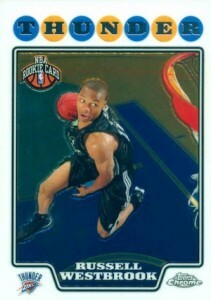 Shop for Russell Westbrook Rookie Cards on eBay. Because he is part of a popular rookie class, unopened boxes with Russell Westbrook's official rookie cards are much tougher to track down. The 2008-09 class also includes Derrick Rose and Kevin Love. However, singles are not hard to find and there are a good amount of low-end Russell Westbrook rookie card options along with several autographed cards. 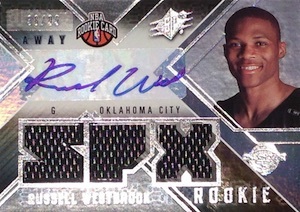 The guide below highlights the most popular and valuable rookies for Westbrook, including all the signed versions. 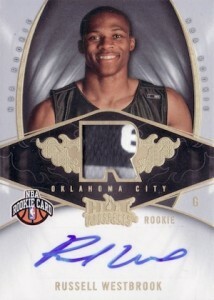 For more choices, view a full Russell Westbrook rookie card checklist in our detailed player profile. 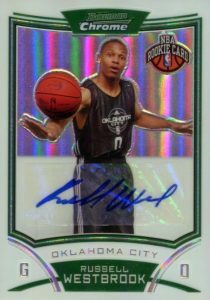 A terrific option that falls lower on the price scale, Russell Westbrook was part of the final basketball rookie class to be featured in Bowman Chrome. In addition to the base rookie card, there is also a signed card, with a different image and card number (#154), included in the main set. Collectors looking for more rarity and value can check out the Refractor parallels for each. 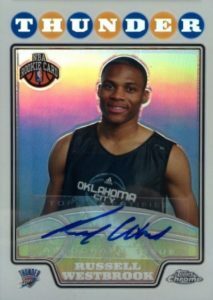 Similar to Bowman Chrome, Topps Chrome is another less expensive rookie option for Russell Westbrook that has a strong following thanks to the Refractor parallels. Topps Chrome edges Bowman Chrome slightly, but the cards are fundamentally very similar. Topps Chrome also has a signed version (#224) in the main set with a different image. 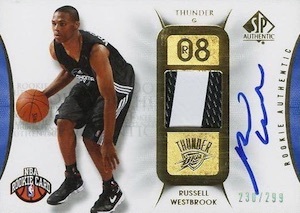 The large print run makes the 2008-09 SP Rookie Threads card for Russell Westbrook one the most affordable options among his signed rookie cards. One noticeable downside is that the autograph is placed over a die-cut jersey piece. As seen below, when the black part of the jersey is used, it is much harder to see the signature. There are some with white jersey pieces that are easier to read, but the versions with black jerseys appear to be more common. 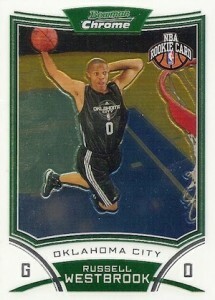 Sitting at just 99 copies, Russell Westbrook's Radiance rookie card is tied with UD Black and SPx as the rarest cards on the list. Although it is a little busy, the card design works, but the sticker is disappointing and the cards can be harder to locate at times. Don't be thrown by the image of a smiling Westbrook as many of his 2008-09 cards display similar emotions. Utilizing a sticker autograph that can blend into the design, Hot Prospects adds a small jersey piece and a print run of 199. There is also an unsigned version of the card that features blue foil. In typical SPx fashion, the loud design is neither subtle nor simple. Although the print run is 99, there are actually two versions—home and away—with minimal differences. 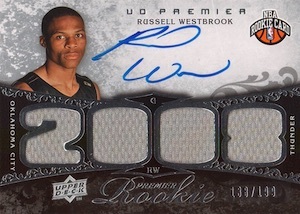 One of the better Russell Westbrook rookie card values on the list, UD Premier features most of the attributes that collectors look for except for a strong brand name. The on-card signature and lower print run are further enhanced by the larger die-cut jersey display. 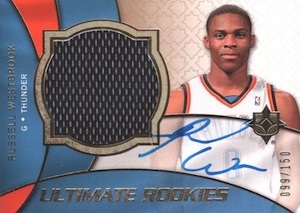 With an appealing design, jumbo jersey piece and strong brand recognition, the Ultimate Collection rookie card for Westbrook is a clear favorite for collectors. The only apparent downside is the awkward signing area that is squeezed into the corner. The base version is numbered to 150, but there is also a signed Silver parallel, numbered to 60, and a signed patch parallel that is limited to only 10 copies. Although the basic layout is similar to UD Premier, UD Black is in a league of its own when it comes to design. 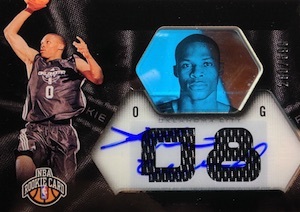 Heavy on black and foil, the Russell Westbrook rookie card really stands out based on the on-card silver ink autograph. 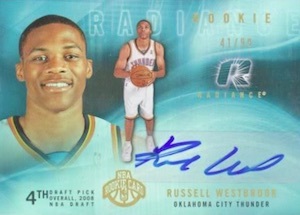 It might seem odd that two of the most plentiful signed rookie cards for Russell Westbrook occupy the top spots, but given the card quality and brand legacy, it should not be surprising. 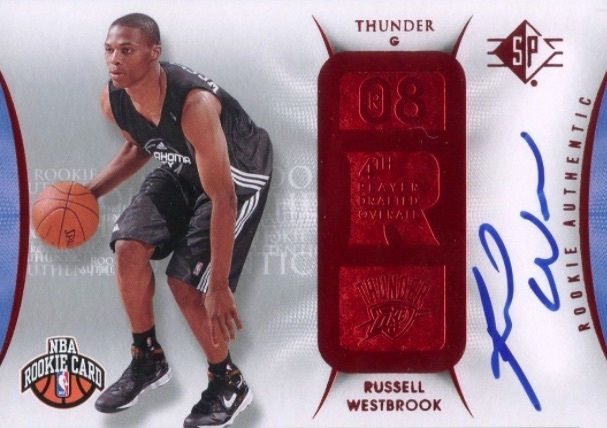 SP Authentic has long been a popular stop for rookie collectors and the 2008-09 rookie for Westbrook regularly sells in the mid-to-high hundreds and breaks into the four-figure range in high-grade. There is also a rare retail version that replaces the jersey piece with red foil. The retail edition is not numbered. 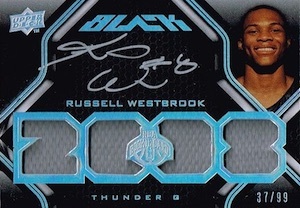 A print run of 225 sounds gargantuan for Exquisite Collection—and it is—but that did not keep the high-end Russell Westbrook rookie card out of the top spot. Collectors can expect prices above $1,500 when talking about these popular rookies. It’s unfortunate that most of the commonly found examples don’t show the actual Thunder jersey. It’s even more unfortunate for me that I don’t have any of the cards shown on this list! 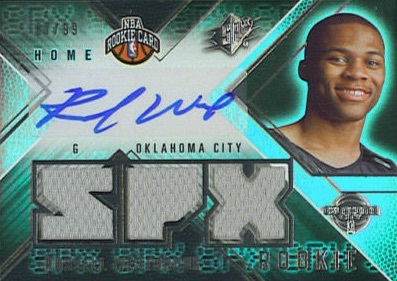 RUSSELL WESTBROOK 2008-09 TOPPS CO-SIGNERS BGS 9.5 ! #2008 2008 ! 1 1 NON AUTO !